When it comes to creating decorative designs on our body, ‘mehndi‘ or ‘mehendi’ tops the chart. This exclusive form of body art is ancient in origin and has been highly popular among women in the Indian subcontinent as well as the Middle East. 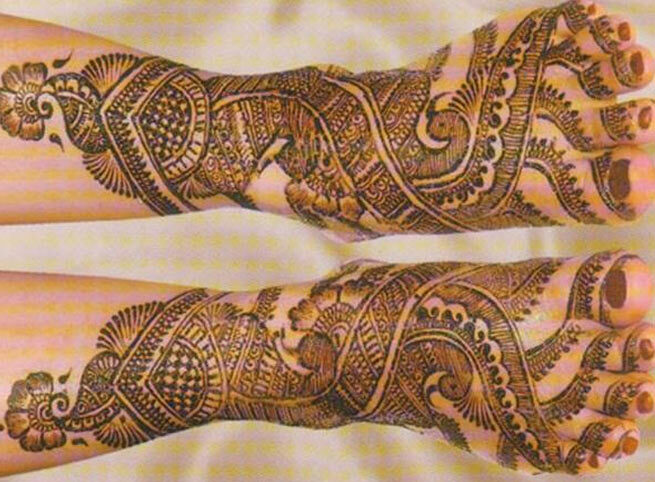 Derived from the henna plant (Lawsonia Inermis) and used for hand, legs, and some other parts of the body, mehndi has now become an indispensable part of the Indian wedding. 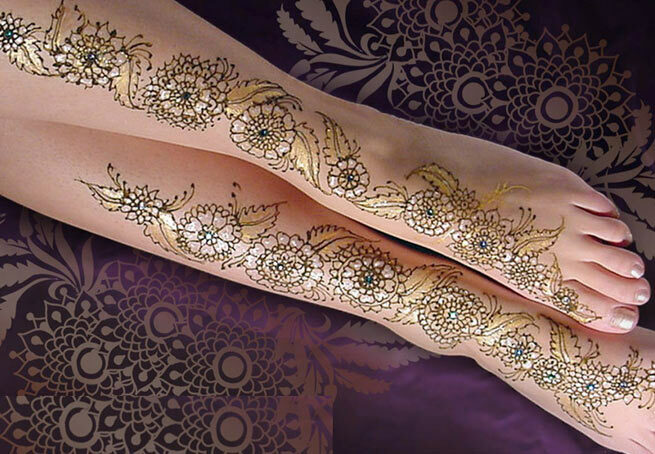 Let’s have a look at 20 awe-inspiring mehndi designs for leg that you cannot take your eyes off. Mehndi is derived from the Sanskrit word ‘Mendhikā’. The use of mehndi is a Vedic custom, intended to be a symbolic representation of the outer and the inner sun, thereby ‘awakening the inner light’. 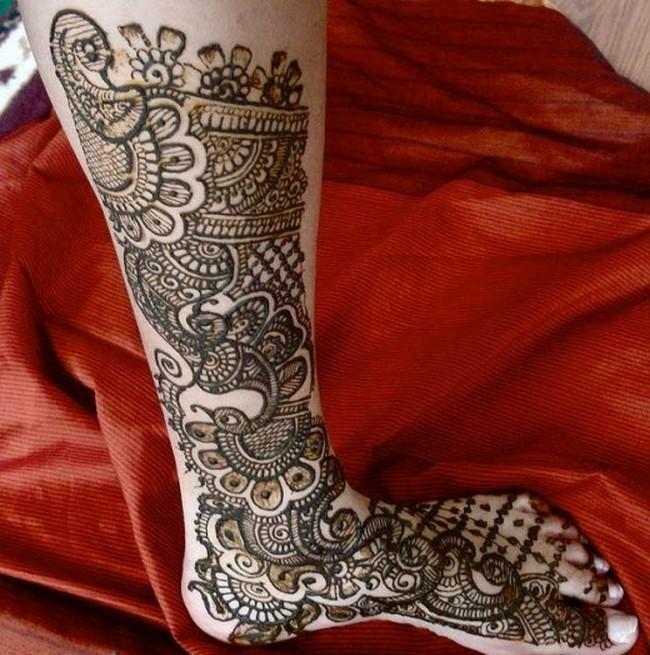 Traditional Indian mehndi designs are representations of the sun on the palm, which, in this context, is intended to represent the hands and feet. 1. Let’s start with this sleek yet breathtaking design. 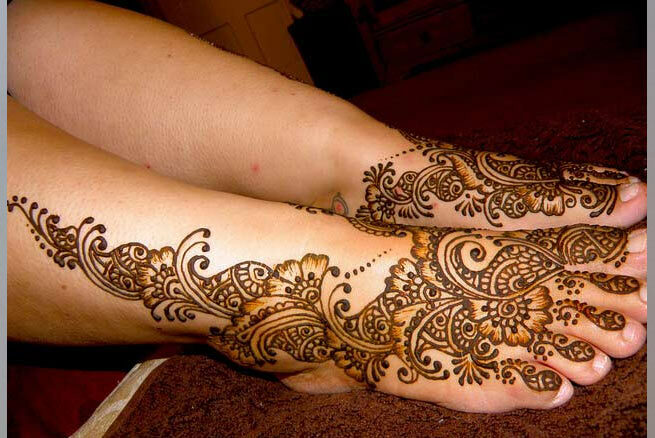 Complementing both feet of a belle, this mehndi design has brought beauty alive in its simplicity. Though the design covers only the edges of the feet, you can add new ideas to it for a gorgeous look. 2. This one includes golden glitter in a floral design ornamented with beautifully crafted henna leaves. The idea is absolutely fresh and the execution is extremely precise. In short, it is elegant and flawless. Needless to say, this design can give any modern tattoo a run for its beauty. 3. Want a cute design to adorn your feet during karwa chauth? This Arabic design will surely attract you. Just look at the beauty and charm of the precise design. amazing, isn’t it? 4. 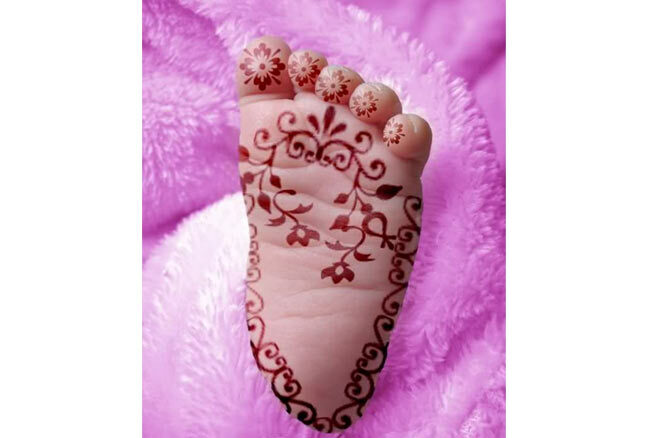 If you love those Bengali style decorations for feet, this mehndi design can get you going. This design looks really attractive with folk art patterns.It surely needs a lot of focus and perseverance to master such eye-catching design. 5. Go modern with mehndi! Defy those painful tattoos with this catchy henna pattern. It starts from the upper half of your feet and goes to the knees. And you can make the style statement by putting it on your single leg. Are you game for it? 6. Tinges of red and lush green on true henna color! 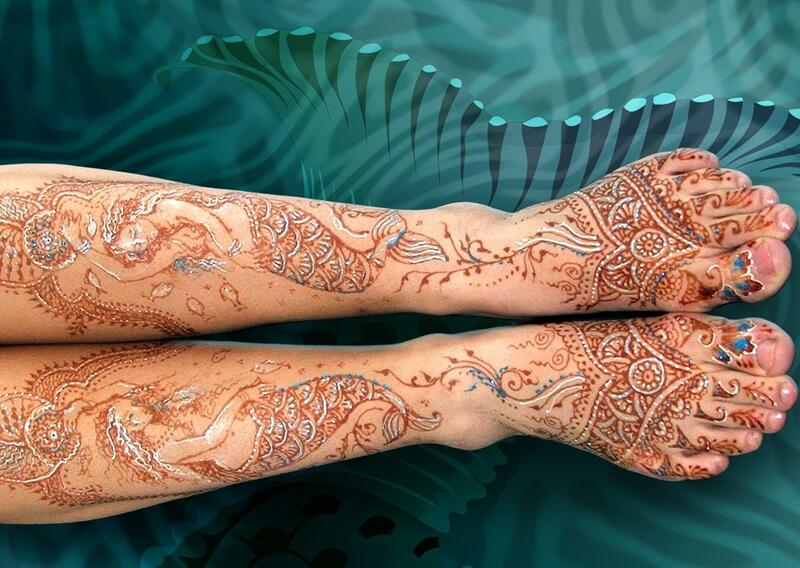 This mehndi design is aesthetically crafted for a bride’s feet. You can certainly try it on your D-day and make your feet look royal! 7. Sizzle in a gown to flaunt this awesome mehndi design. 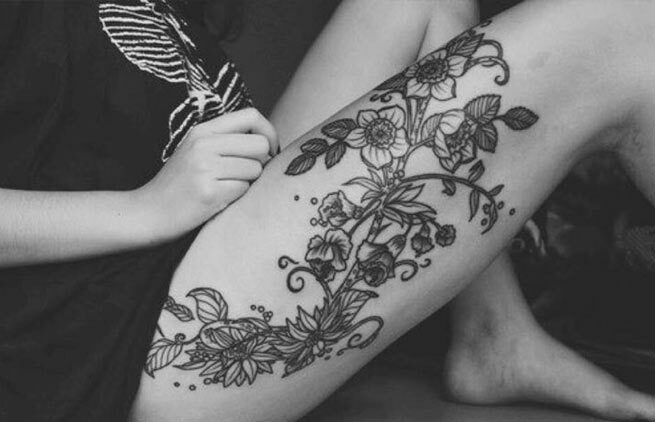 This floral pattern goes beyond the myth of henna being traditional. Draw it on your feet to draw everyone’s attention instantly. 8. An artistic design on the upper part of your feet and complementing patterns on your fingers – this design is good to be put on every occasion when you want to adorn your feet beautifully as well as want to keep it simple too. 9. Who says henna is only green? Paint your feet blue this season. In cute paisley designs, this mehndi pattern will look amazingly attractive. To make your feet look more appealing, pair it with pink nail paints. 10. Flaunt your feet in tones of red and maroon. 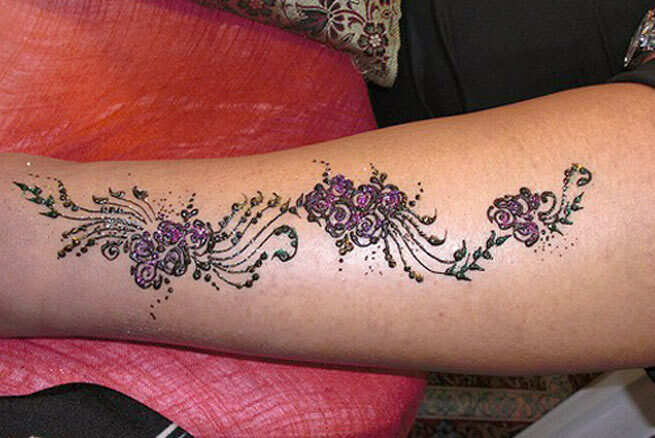 This mehndi design is traditional with a wonderful modern twist. But the best thing about this design is that it is too simple yet too gorgeous. 11. When it comes to the D-Day, every girl loves to stick to the best-kept Indian tradition. 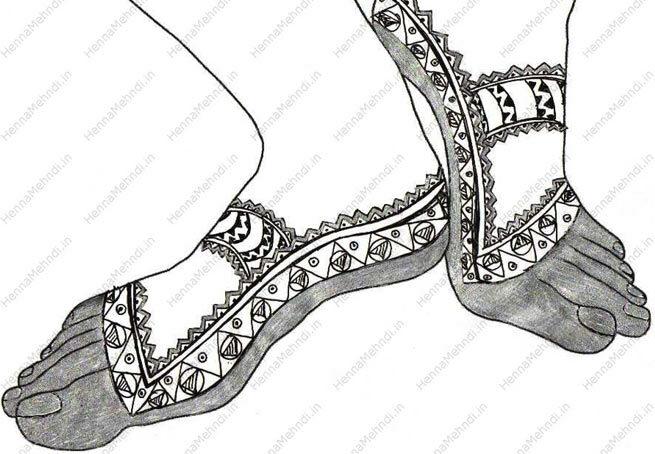 Adore your culture’s richness with this intricate Marwari Mehndi design on your feet. 12. How about going different with your mehndi designs? 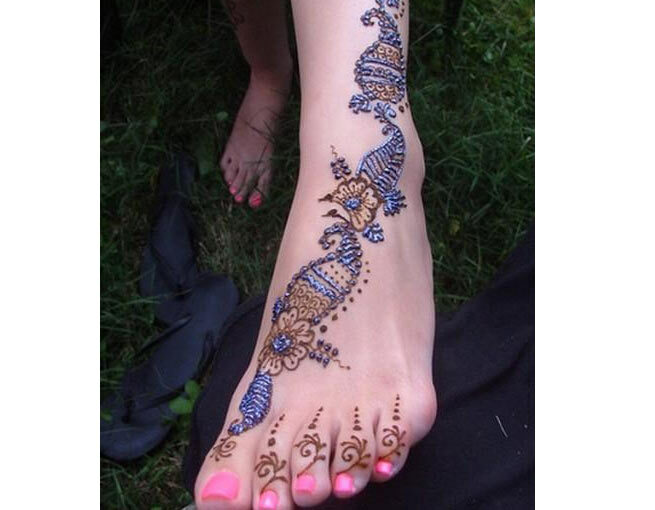 Everyone adorns the upper sides of feet with henna, but you can be different by making attractive designs on the bottoms of your feet. This cute picture is enough to understand how adorable it can look. 13. 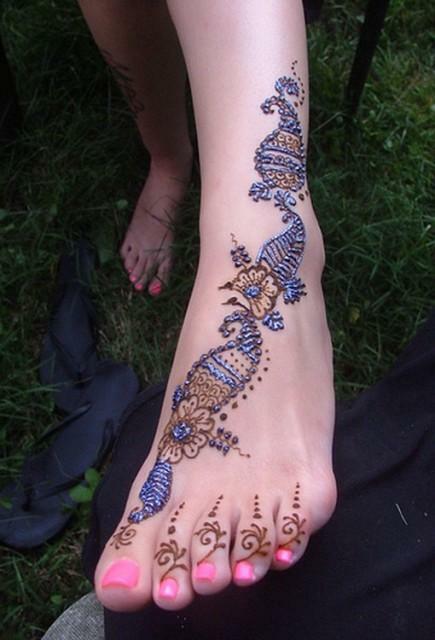 With mehndi, your feet can actually turn out to be a nice canvas. 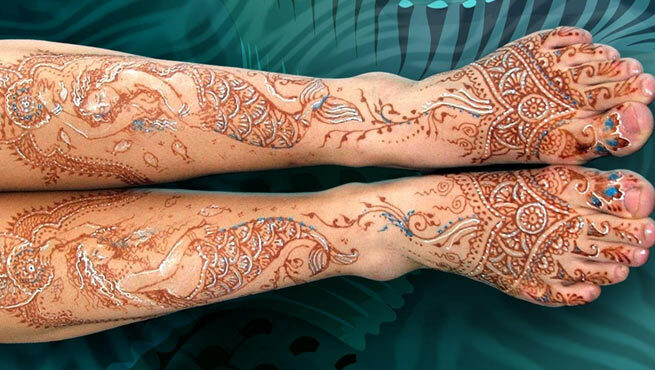 Go for an artistic mermaid design with the shown pattern. It’s not only unique but also extremely pretty. 14. 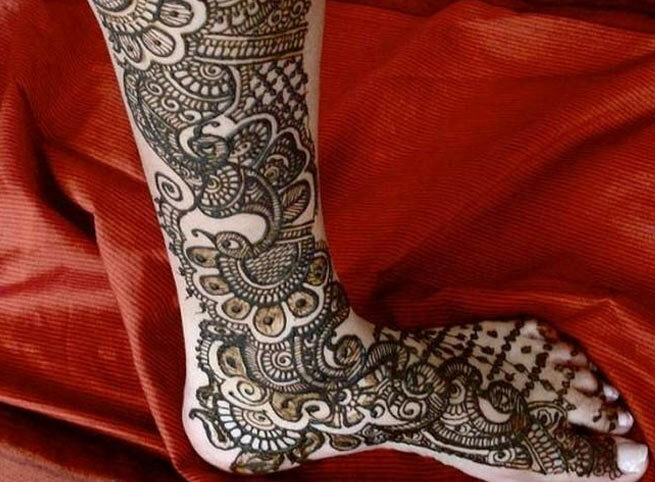 A full-leg mehndi design can’t be more beautiful than this! It has every ingredient of an authentic Indian Mehndi pattern. Only a pro can create such marvelous design, indeed! 15. Add colors to your party with this attractive floral mehndi pattern for legs. Wear a short traditional skirt and let people know about your Indian inheritance in tones of modernity. 16. This chic design has many reasons to allure girls. 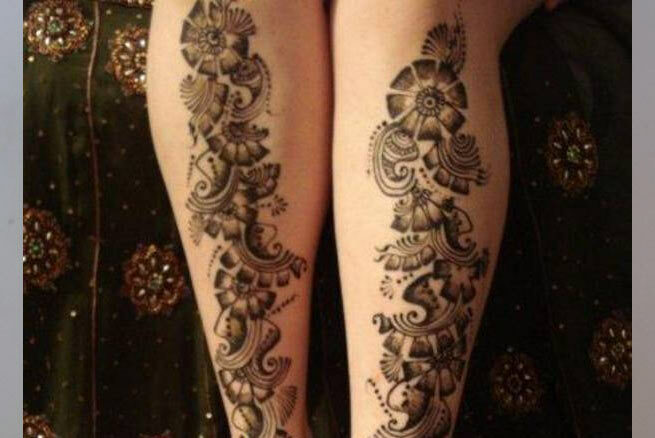 Applied to the rear part of legs, this modern mehndi design is simply exquisite. 17. If you think that mehndi can be applied in only on the lower body of a person, you are wrong. It looks equally beautiful when put on thighs. Don’t believe us? See yourself! 18. Go for a hip-hop party with this cute mehndi design. It may not be very precise but will increase your glam quotient for sure. 19. A common design can also turn into a unique mehndi pattern if you add a little bit of creativity to it. This attractive mehndi design on legs can allure any teen queen with its floral grandeur and cute motifs. 20. 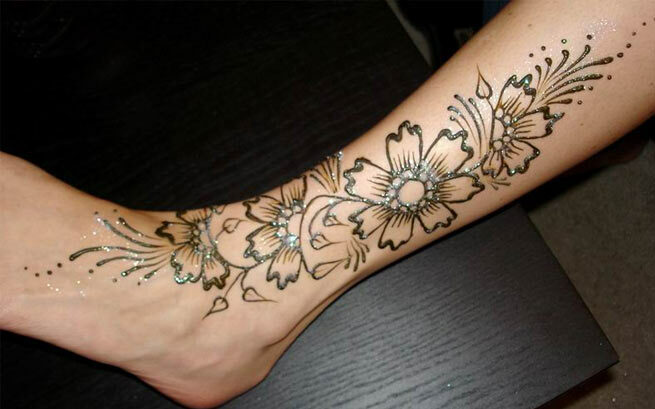 Go for a full leg decoration with this mehndi design. An apt pattern for newlyweds, this design will even look strikingly beautiful with western bottom wear.